This post will most likely resemble one of James', in that I am summarizing lots of various activities of the weekend, which are otherwise unrelated. 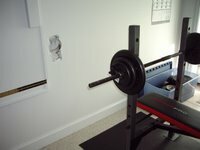 The weekend started out with my dumbass move of putting the weight bench through the basement wall. I was setting up to do my squats, and I had just placed 180 lbs on the bar, when the whole weight bench tipped up and over and into the wall. You're supposed to counterbalance the bench with weights on the other end. 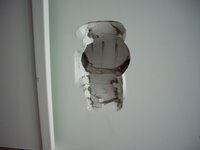 However, I was in a rush, and wasn't paying enough attention, and well, you can see the damage. 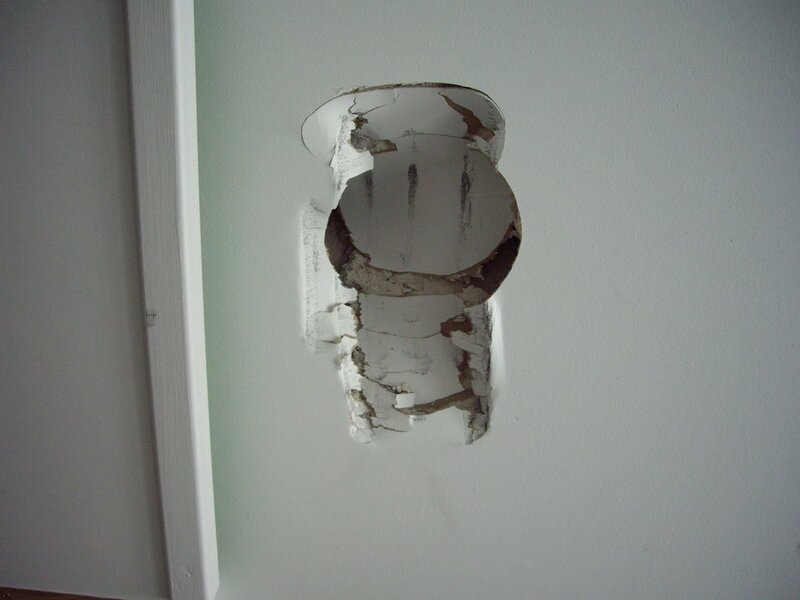 I'll be doing more wallboard patching in the very near future. After that on Saturday, we held a very successful yard sale. We netted $385. Not bad for getting rid of old junk. 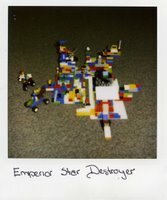 Most of the boys' toys we were just giving away for $0.25 each. But the big selling item was the old CD collection. I had about 300 CDs, which I sold for $1 each. Almost all of them sold, except for my jazz collection. What's left is a really good collection of jazz music, which is perhaps not too appreciated in P-ville, Virginia. Maybe a roadtrip to DC would be warranted in trying to sell the rest of it. After the service, it was a pot luck. Protestants sure do like their pot luck dinners. There's an old joke, how does a Methodist get into heaven? They bring a covered dish. 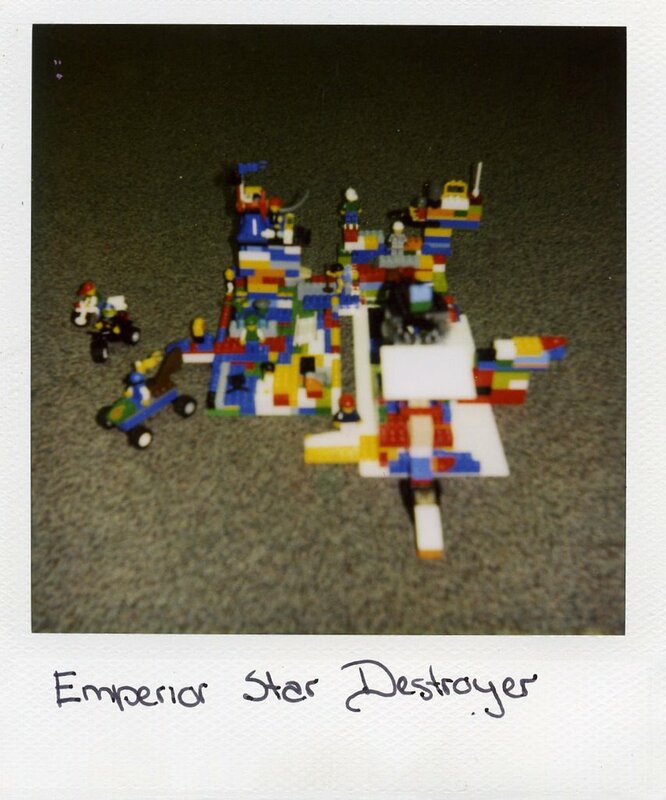 Totally unrelated, Luke asked me to post his picture of his "Emperior (sic) Star Destroyer" which he made in Lego Club (an after school activity). Very creative. Finally, we learned that Mom and Dad, Uncle Bobby and Aunt Terry, all survived the earthquake in Hawaii this week. They definitely felt the tremors, and are now stranded there for a few more days because it has delayed their flights for some reason. At least they're okay. Wait, are you implying that my posts are eclectic and have no underlying rhyme or reason? I would take affront at that were there not a large dose of truth in it. Beautiful song by Eddie & the choir. His choir leader is amazing!